An artist's illustration of Earth's hot, molten moon as it forms from a synestia: a giant, spinning doughnut of vaporized rock formed from the collision of two other planet-size objects. Earth's moon formed inside a cloud of molten rock, and may have done so before our planet itself formed, a new theory suggests. Scientists call such a cloud a synestia, a doughnut-shaped ring of debris full of molten rock that forms in the aftermath of a protoplanet collision. In this case, it would have been a massive collision early in our solar system's history. According to the new theory, the moon formed within a few dozen years after the crash, as the synestia shrank and cooled. The Earth subsequently emerged about 1,000 years after the moon. "The moon is chemically almost the same as the Earth, but with some differences," she added. "This is the first model that can match the pattern of the moon's composition." A synestia is a hypothetical object first proposed by Stewart and a Harvard University graduate student, Simon Lock, in 2017. They also are co-authors on the new study. In 2017, Lock and Stewart modeled the chain of events that would occur after Earth-size rocky planets smashed into other large objects, carrying lots of energy and momentum with them. The predicted result was a doughnut-shaped disk, according to press materials released that year. Their name for the newly described object, synestia, comes from the prefix "syn-" (together) and the Greek goddess "Hestia," who represents architecture and structures. Synestias haven't been spotted in the sky yet, but the authors suggest that's because the objects are relatively short-lived. After formation, they may persist for only a few hundred years. 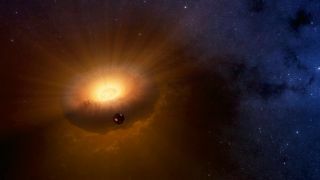 Synestias that formed gas-giant planets or stars, however, may last longer due to their larger size, the authors said. Back in 2017, the team was focused on how planets could be formed after huge impacts. (The usual model cited today for planet formation suggests core accretion through gas molecules and dust particles sticking to each other.) At the time, however, Lock and Stewart hinted that synestias could also be useful in explaining the moon's formation — especially because Earth's moon is so similar in composition to our planet. "Getting enough mass into orbit in the canonical scenario is actually very difficult, and there's a very narrow range of collisions that might be able to do it," Lock said in a statement from Harvard University. The older collision theory is not the only explanation proposed for our moon's history. Some scientists suggest that the Earth and the moon formed together (co-formation theory), while others say the moon used to be a free-flying object that was captured by the Earth (capture theory). There's even a theory suggesting that Earth stole the moon from Venus. Here's how the moon formed as proposed by the new, synestia theory. A giant collision smashed into the proto-Earth, vaporizing about 10 percent of the rock and liquefying the rest. This created a synestia. Over time, a little bit of liquid rock condensed near the center of the cloud of material. As the molten structure lost its heat, rock continued to condense and rain toward the synestia's center. "The rate of rainfall is about 10 times that of a hurricane on Earth," Lock said. "Over time, the whole structure shrinks, and the moon emerges from the vapor. Eventually, the whole synestia condenses, and what's left is a ball of spinning, liquid rock that eventually forms the Earth as we know it today." The moon is also bereft of volatiles, which are substances such as hydrogen that have a low boiling temperature. The synestia theory suggests that this is because the moon formed at a high temperature of 4,000 to 6,000 degrees Fahrenheit (approximately 2,200 to 3,300 degrees Celsius). Better yet, Lock explained, the collision doesn't have to take place from a certain angle to form a synestia. More collision angles are plausible for a synestia than for the older collision theory involving a young Earth and a Mars-size object smashing into each other. "Basically, this is the first model that has been able to explain the complications and that has been able to do it quantitatively," Lock said. "This is a dramatically different way of forming the moon. You just don't think of a satellite forming inside another body, but this is what appears to happen." Lock added that more work is planned to better define the theory, particularly concerning how the moon interacts with the vapor in the synestia. "When the moon is in this vapor, what does it do to that vapor? How does it perturb it? How does the vapor flow past the moon? These are all things we need to go back and examine in more detail." The research was published Wednesday (Feb. 28) in the Journal of Geophysical Research: Planets.